Sorry... the 2017 Volvo XC90 is no longer being sold as new. 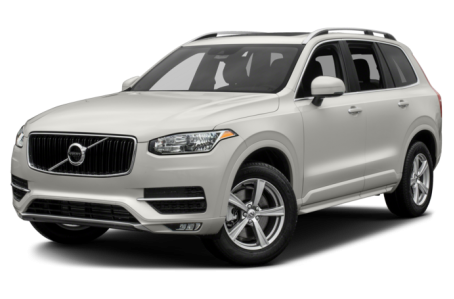 Instead, take the first step to a great deal on 2019 Volvo XC90 with a free price quote! Redesigned last year, the XC90 is Volvo's flagship SUV. It seats five people in two rows or seven in three rows, depending on the model, and comes with front- or all-wheel drive. It's powered by a choice of four-cylinder engines, one of which is supercharged and turbocharged. A plug-in hybrid version is also offered. Competitors include the Audi Q7 and BMW X5. Most versions now have Apple CarPlay smartphone connectivity, which mirrors select iPhone apps on the XC90's dashboard screen. LED headlights are now standard and a new Luxury Package available for Inscription models features a Nubuck headliner and roof pillars, leather grab handles, leather sun visors and massaging front seats. The plug-in hybrid drivetrain of the XC90 Hybrid uses an electric motor to drive the rear wheels while a supercharged and turbocharged four-cylinder gas engine runs the front wheels. Total system output is 400 hp and 472 pounds-feet of torque, according to Volvo. With a full charge, the electric motor is capable of powering the XC90 Hybrid for about 25 miles in a driver-switchable electric-vehicle mode. For 2017, the XC90 Hybrid gains Apple CarPlay smartphone connectivity as well as a limited-edition high-end Excellence trim level. The four-seat Excellence model features heated, ventilated and massaging seats, Nappa leather upholstery, and a rear beverage cooler with two crystal glasses.